The Best Introvert blogs from thousands of top Introvert blogs in our index using search and social metrics. Data will be refreshed once a week. Introvert newsletter is a comprehensive summary of the day's most important blog posts and news articles from the best Introvert websites on the web, and delivered to your email inbox each morning. To subscribe, simply provide us with your email address. About Blog Introvert, Dear is a community for introverts and HSPs. Our mission is to let introverts everywhere know it's okay to be who they are. Get insight and inspiration about introversion, high sensitivity, and personality type here. Facebook fans 215,883. Twitter followers 31,846. Facebook fans 86,556. Twitter followers 5,453. Global About Blog Quiet Revolution is a mission-based company co-founded by Susan Cain. It contains advice and stories for introverts and extroverts alike on how to appreciate our quiet sides featuring essays, videos, interviews, and more. Facebook fans 80,416. Twitter followers 29,509. San Francisco, CA About Blog At Introverted Alpha, we love men. Especially smart, introverted men. That's why we are devoted to helping them get the one thing they're often missing: a successful, fun dating life. Get effective introvert dating tips for shy guys at Introverted Alpha. Facebook fans 2,504. Twitter followers 2,936. Facebook fans 1,145,776. Twitter followers 506,585. Pacific Northwest, USA About Blog The mission of The Introvert Entrepreneur is to empower introverts who want to understand, own and leverage their strengths for personal and professional success. Facebook fans 40,105. Twitter followers 6,889. Atlanta, GA About Blog Jennifer B. Kahnweiler, PhD, Certified Speaking Professional, is an author and global speaker hailed as a “champion for introverts.” Her bestselling books The Introverted Leader, Quiet Influence, and The Genius of Opposites have been translated into 16 languages and have helped introverts throughout the world expand their leadership capacity. Facebook fans 2,113. Twitter followers 8,111. Kansas City About Blog Introvert Whisperer provides smart, actionable career advice for Ambitious Introverts. Facebook fans 3,678. Twitter followers 1,951. Brighton, England About Blog Cat Rose is at your service. I help creative introverts (like myself) show their work to the world - without feeling like a sleazy car salesman. Facebook fans 2,178. Twitter followers 940. About Blog Hi, I’m Steven Zawila. I’m an introvert. I’m here to tell you that there’s another way for introverts to get the relationships we want. An ethical, honest, natural way. Dallas, Texas About Blog Psychology Today is the only general interest magazine devoted exclusively to everybody’s favorite subject: ourselves. In the Introvert's Corner, we talk about living life quietly, and assert our right to do so. Facebook fans 9,078. Twitter followers 3,231. New York About Blog BuzzFeed is building the defining news and entertainment company for the social mobile age. Find the latest introvert Buzz on Buzzfeed. Facebook fans 10,577,412. Twitter followers 5,989,653. About Blog Introvert Problems is a place where all introverts get together and unite. Facebook fans 2,407,593. Twitter followers n/a. About Blog My mission is to help 1,000 introverts on their path to financial independence. This mission of this blog is to Help introverts understand themselves and those they interact with better, Discuss philosophies and thoughts that make work more enjoyable, more meaningful, and less infinite and Explore small and large ways to get to financial independence. Facebook fans 11. Twitter followers 570. Irvine, CA About Blog Entrepreneur seeks to inspire, inform and celebrate entrepreneurs. Read the latest news, videos, and discussion topics on Introverts. Facebook fans 3,364,915. Twitter followers 3,230,903. About Blog INFJ Blog is a blog for the rarest of the MBTI personality types. We just want to make the world a better place as quietly as possible. Facebook fans 613. Twitter followers 13,407. About Blog Louder Minds is a place for introverts to not meet, quietly, and in a well planned way. Facebook fans 31,862. Twitter followers 56. Sydney, Australia About Blog A website and community that celebrates the art of living and writing quietly, creating our wholehearted story and encouraging others to do the same - created and led by Terri Connellan. Facebook fans 647. Twitter followers 3,342. About Blog Welcome to the combustion of satires, philosophy and real life experiences. A perfect destination to flex your reading muscles up. Portland, OR About Blog Welcome home, introvert. I'm Tyler, and I created Riskology to be a community where introverts master their psychology and make a dent in their universe—little steps every day to build something great. Facebook fans 3,268. Twitter followers 19,352. About Blog Sociable Introvert provides free information on interpersonal skills, effective communication, shyness, self confidence and social anxiety. Facebook fans 2,283. Twitter followers n/a. Facebook fans 423,005. Twitter followers n/a. Williamsburg, VA About Blog Patricia Weber is an Introvert inspirer, providing practical tools for the introvert to navigate the rules at work. Facebook fans n/a. Twitter followers 6,079. Land of Lincoln About Blog The INFJ Cafe is about the unique and complex make-up of the extraordinary INFJ personality type. Facebook fans 11,572. Twitter followers 852. Australia About Blog The Introvert Effect is a community by introverts for introverts. With articles, resources, tips, and information about understanding your own quiet nature, you can impact the world in your own quiet way. Facebook fans 337. Twitter followers 34. Los Angeles, CA About Blog Introvertology helps introverted entrepreneurs become confident with marketing so they can build a profitable business. You don't have to do this alone. Facebook fans 301. Twitter followers 4,900. Bandarlampung About Blog Ex of Introvert is written by Kesuma Ariyanti. Read Ex of Introvert to find out more about the opinions of an introvert. Canada About Blog Dynamic introverts are succeeding in all walks of life and rewriting what it means to be an introvert in the 21st century. Facebook fans 72. Twitter followers 196. Facebook fans 327. Twitter followers 387. About Blog Self-Promotion for Introverts, written by Nancy Ancowitz, offers a gentle approach to getting the recognition and opportunities you deserve. Get career advancement tips, quips and insights for the quieter crowd. Facebook fans 966. Twitter followers 2,623. About Blog My name is Mama Sow. If you are wandering around my blog it means that you are creative, have dreams, but just don’t know how to get there! Maybe you don’t feel like you have a life purpose and would love to find it: don’t worry I am here for you! I have gone through everything you are going through from shy introvert to me today still on that journey of building the life I want on my terms. I want to help you do that with yours! About Blog Introvert Kingdom is a self-discovery space for creative introverts to get clear, bold and authentically expressing. Facebook fans 207. Twitter followers 183. About Blog Living Inside My Head takes a humorous look at introverts. Living the Introvert’s Dream is aimed at two types of people: Introverts who like to laugh and everyone else who likes to laugh. If you are a member of one of those groups, I hope you enjoy. About Blog Hi, I'm Kelsie. The Introvert's Journey is a lifestyle blog on exploration, self-discovery, & new experiences with a focus on all things travel related, culture, health & fitness, and food. The blog was created to break out of my comfort zone & pursue my many interests in life. About Blog I am a doting mom to my Ayla Chloe Zephyr, a loving (at times, nagging) wife to my chef, Francis, and a woman who is often lost in an internal fantasy world. Get to know the perks and perils, the ups and downs, of being an introvert mom in the world of coffee, social media and quarter-life crisis. About Blog Being introverted isn’t a weakness. It’s a lifestyle. United States About Blog Introverted Art is a blog about introversion, art, and the search for a meaningful life. About Blog I’m a Boston introvert, always traveling, writing, and making music. I post daily about any one of those things, or whatever’s on my mind. The Playground is a nice place to relax for a few minutes, get yourself thinking, and enjoy the company of a community of introverts just like you and me. 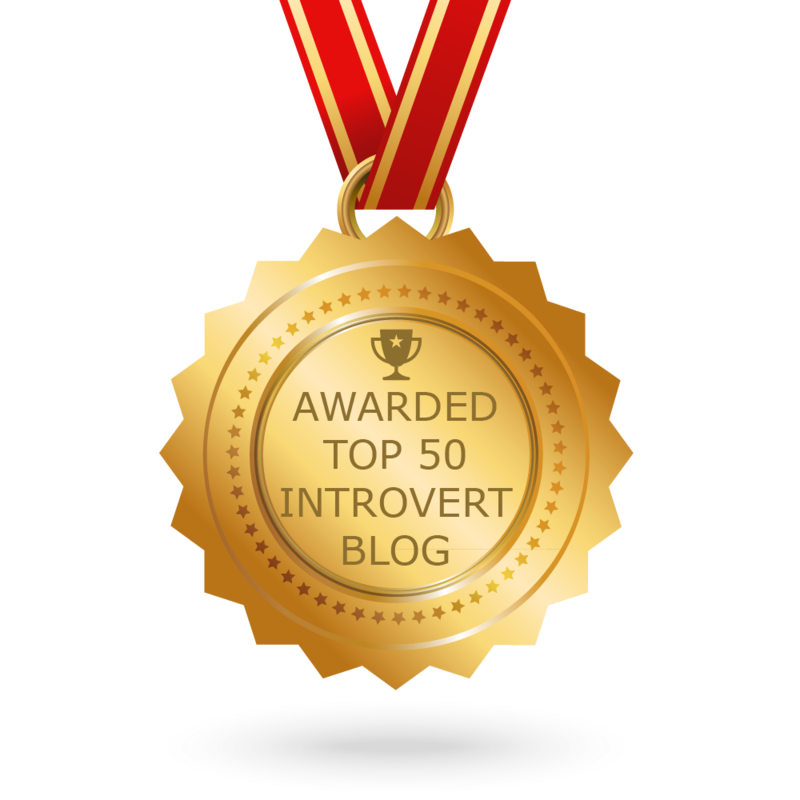 CONGRATULATIONS to every blogger that has made this Top Introvert Blogs list! This is the most comprehensive list of best Introvert blogs on the internet and I’m honoured to have you as part of this! I personally give you a high-five and want to thank you for your contribution to this world.